The history of the Castello di Masino, in the part of Piedmont called the Canavese, goes back over 1000 years. It is surrounded by a 19th-century park and overlooks the broad sweep of the glacier-formed hills around Ivrea. It is the former residence of the Counts Valperga, descendants of Arduino, the first king of Italy, and it retains the atmosphere of its grand past in its sumptuous state rooms, private apartments, and splendid library. The decorative scheme is an example of late 18th-century taste inspired by the paintings discovered at the ancient Roman sites of Pompeii and Herculaneum. 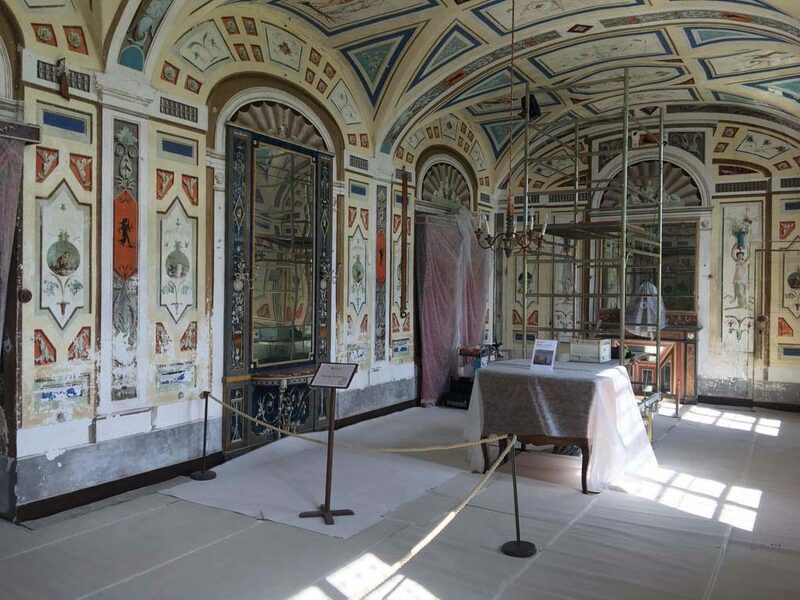 FAI UK has responded to FAI’s call for support in the restoration of the room known as the “Sala delle Tre Finestre” (room of three windows). 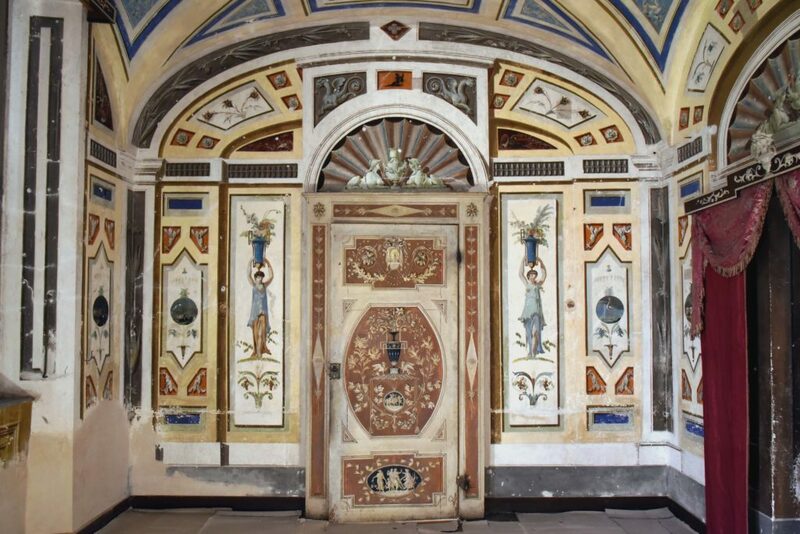 Following an initial clean of the frescoed surfaces, work will continue with the consolidation of all the walls, the restoration of the ceiling, of the intricately modelled door, and the reinstallation of the historic furnishings. 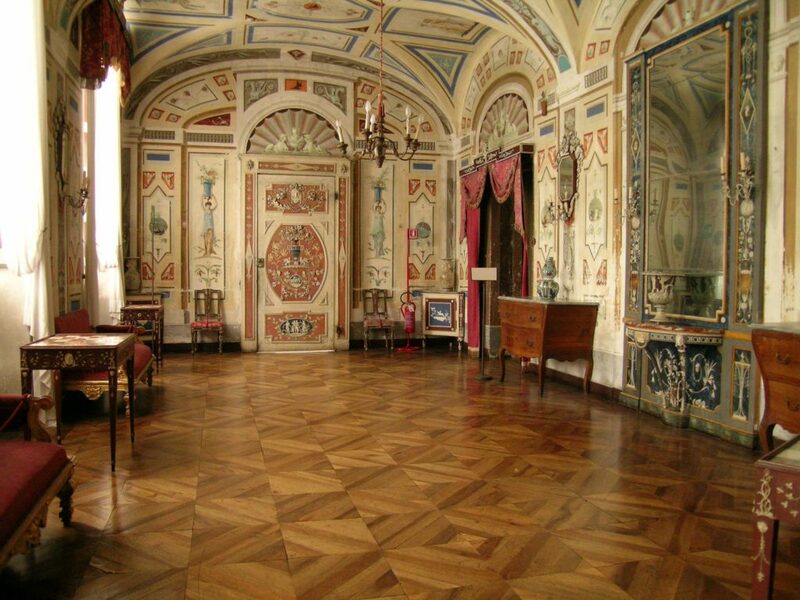 This room was created at the behest of Count Carlo Francesco II Valperga di Masino, Viceroy of Sardinia, in the last decade of the 18th century. With the assistance of the architect Filippo Castelli, the count decided to modernise the new rooms in the eastern wing. This one was originally a loggia looking out over the internal terrace, then closed off and incorporated into the count’s apartment to provide a place for conversation and leisure—the archives confirm that the room was originally furnished with card tables. In the early 20th century, the room was used as a study for the display of mementos of the Valperga family. The decorative scheme of the “Sala delle Tre Finestre” was devised by a painter and set designer active in 1790s Turin, Gaetano Vigna (and his studio). It consists of panels with grotesques of caryatids, small glimpses of landscapes, and animals, sphinxes, and dragons. The marble fireplace, the seat furniture, small mahogany tables with motifs modelled in white rice-powder and stucco, and the impressive wooden door with its plaster ornament complete the neo-classical setting.